Apart from the mother country, Portuguese is usually associated with Brazil, but it is also the official language of Mozambique, Angola, Guinea-Bissau, Cape Verde, East Timor, Equatorial Guinea and Sao Tome and Principe. Together, these countries comprise the Community of Portuguese-speaking Countries (CPLP), an organization for friendship among Lusophone (Portuguese-speaking) nations. The very term Lusophone is derived from the Ancient Roman province of Lusitania, which covered present-day Portugal. Each of these Lusophone countries has its own dialect that greatly differs from the language spoken in Portugal. For example, Brazilian Portuguese differs from the European variant by an extensive set of grammatical rules, syntax and vocabulary. Voce and tu both mean you, but the latter is used frequently in some regions as a colloquial expression, while the former is the official variant of the term. Voce is not well received in Portugal nor used there. Many words have two variants; train: comboio (Portugal) and trem (Brazil); farm: quinta (Portugal) and fazenda (Brazil). Apelido means “last name” in Portugal and “nickname” in Brazilian Portuguese. But differences don’t end here: Brazilian Portuguese also differs greatly from Mozambican and other variants; at the same time, every variant has its own set of differences, adding to the linguistic mash. In today’s world of global communication, there is a need for a “universal” Portuguese, a variant that will be accepted and spoken worldwide. Although there is still heated debate on the subject, many steps have been made to bridge the gaps between and among the multiple variants. In 1990, the Portuguese Language Orthographic Agreement was established. Its purpose is the formation of a unified orthography for all the Portuguese-speaking countries. This agreement has facilitated communication and reduced spelling differences among countries of the Lusophone world. With more than 250 million speakers, Portuguese ranks as the sixth most spoken language in the world and Portuguese translation is one of the most requested services from translation agencies. Brazil claims the biggest part of Lusophone population (201 million, more than 80%), so it would be logical to expect Brazilian Portuguese to become the standard variant, accepted by most Lusophones. Time will tell whether this variant will become the dominant one. Until then, Portuguese-speaking nations will continue to make their best effort to understand one another. Speaking a language is not enough, even when the language is a translator’s mother tongue. In contrast to growing up with a language, formal education provides extensive knowledge of grammar, linguistics and cultural norms. The person who has studied the systems and connotations of a language understands how the language works and has been directly exposed to the intricacies of the language, working with it in a variety of contexts. Therefore, never underestimate the importance of education. You cannot expect one person, even a translator, to know every subject. Translators are no miracle workers, so don’t treat them as such. Hire according to their area of expertise. If someone claims to be an expert in several fields and offers no proof to support that claim, know that you’re on the wrong track. Find someone with both the language skills and expertise in the specific area of the document for translation. Translating into one’s native tongue is absolutely essential. Some people who are bilingual can do quite well in both source and target languages, but hiring translators who translate into their native language is a safe bet because you won’t have to fear about the end result. High-quality translators keep current with the times, and know how to make use of modern technology. Most of them have a strong social media presence, a professional-looking website and excellent testimonials. In today’s world, reputation is an absolute must, and excellent translators are completely aware of how to create and safeguard a sterling professional reputation. All of the aforementioned qualities will not mean much if the final one isn’t present. High-quality translators stick with you till the end and invest 110 percent of their efforts to reach a satisfactory result. They are always ready to answer any question that you might have, and they never express nervousness. They are not mere workers, because they perceive themselves differently. They are artists in the true sense of the word. Great translators are such perfectionists, willing to do whatever is necessary to deliver an excellent copy, that nothing will stop them from reaching their goal to be the best. You might have to pay a bit more, but the cost will definitely be worth it. Weigh all of your options, and think carefully before deciding who your translator will be. Remember that it’s not always about the price, but about the quality. The moment you find a professionally trained, passionate person with a strong reputation, a specialized area of work and the readiness to translate exclusively into their mother tongue, you’ve found the right service provider for your needs. How To Communicate Internationally Without Getting Kicked in the A*%! Our world today is far more competitive than it was in the past, in part because networking has brought uniformity in many aspects of life around the world. Today becoming a global citizen in the true sense of the word, requires one to be adept to many things. Also, the emergence of global companies has set new HR standards whereby only a true global citizen can excel. 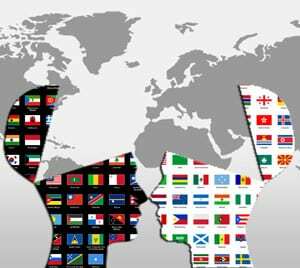 To become a global citizen, one must be proficient in more than one language. In today’s world, bilinguals definitely have an edge over monolinguals. Polyglots knowing more than two languages definitely increase their value in their professional careers. People with good linguistic and communication skills such as legal translators frequently take preference over others without a multiple language facility, and rightly so. Additionally many people use their linguistic skills professionally to become experienced translators and leading translation agencies throughout the world. The field of translation is an attractive career option because the need for professional translators is increasing as a result of the expansion in international business and trade. In all likelihood the need for translation will further increase in future. Thus those considering making translation a full-time or part-time career should have few reservations. Internet and other information technologies are now commonly used for commercial purposes. For this reason most companies provide personal laptops, cellular phones and other tools to their workers and expect them to be technology savvy, since the use of technology minimizes the risk of errors and saves time. Employers also usually provide the latest software available in the market and expect their employees to stay up to date with new apps. Marketing and sale of products is also promoted through social media. Nowadays marketing and sales personnel of international companies run their advertising campaigns primarily through the Internet. Many advancements have also been made in the wireless networking technology. To become responsible global citizens, professionals must shun all racial prejudices, which can become major obstacles in free interaction with members of other communities. A global citizen must be flexible enough to work in a multicultural environment and maintain a good work relationship with foreign colleagues. One’s personal feelings, religious or cultural differences cannot affect relationships at work. A global citizen acts responsibly in the workplace and keeps personal opinions personal. Because our world has become a highly competitive place, the worth of an individual is based upon his/her ability to compete successfully in the competitive marketplace. This ideology may seem opposed to the idea of equal rights for all humans, which is the foundation of all democratic states, but when we talk about rights, every individual has the freedom to excel and make the most of his/her life. Individuals are at liberty to compete freely to obtain their share of wealth, power and prosperity. And every global citizen has the potential to compete with others. As long as a person uses an acceptable means to achieve his/her goals, competition remains healthy. All these attributes shape an individual into a global citizen. Today global citizenship is an aspiration of everyone hoping to become globally successful, for global acuity is increasingly important for survival in a global economy. Germany, or Deutschland as Germans call it, is located in Central Europe, where it has a rich and distinctive history and culture. Because it shares its borders with nine countries–Austria, Belgium, the Czech Republic, Denmark, Luxembourg, the Netherlands, Switzerland, France, and Poland–other cultures have greatly influenced German language, culture and lifestyle into what Germany is today. Neighboring countries, particularly Austria, with which it shares the longest border, is the most similar to Germany. For a tourist, there are plenty of historical sites in Germany. The Trier baths, Roman Amphitheater. Black Gate (Porta Nigra) and pillars of the Roman Bridge over the Mosel; the Weiden Roman Burial Chamber on the outskirts of Cologne, the Drusus Stone on the grounds of the Mainz citadel, and other remains date back to the 1st and 2nd centuries. However, Roman ruins are common throughout Germany. Other historical monuments are fairly new as compared to these. The Brandenburg Gate, the remains of the Berlin Wall separating East and West Germany at one time, the Berliner Dom as well as castles and palaces built by dukes or Prussian emperors are major attractions for tourists. Germans, who are very hard working, place much value on precision and order in almost every aspect of their lives. They do not compromise on the quality of work. You will not find them frivolous. In fact, they are generally raised with a sense of responsibility ingrained in them. They are highly committed, self -disciplined, and generally reserved. This doesn’t mean they are unfriendly, but they may take a while to be communicative, especially when mingling with other cultures. The eating habits of Germans are not very different from those of other Europeans. They consume pork more than twice as much as beef or goat meat. Schweinshaxe and Saumagen, as well as pork sausages, are staples of German diet. Germans also eat bratwurst. beets, cabbage, cauliflower and other veggies as parts of their meals. Potatoes in all forms are a staple, as is brown bread. Usually German food is bland with little or no spices added. As a large Turkish population lives in Germany, Turkish cheese and sausages, Turkish bread and doner kabab are also easily available. Beer, brandy and schnapps are the most popular alcoholic drinks in Germany. A large majority of the German population is Christian, divided almost evenly between Catholics and Protestants. Due to a large population of Turks and migrants from other Muslim countries, 5 percent of the population is Muslim. Jews are few because of the massive deportation and extermination during the Second World War. Around 95 percent of the population speaks German, but some people close to the Rhine estuary also speak Serbian. Turks speak German, as well as Turkish and Hebrew. People living close to the Danish border speak Danish, whereas an indigenous language, Romani, is also spoken by a very few. Apart from the Christian holidays, Oktoberfest is one of the most colorful events that Germans celebrate. It lasts a fortnight. The festival is a source of joy for adults and children alike. The actual event is centered in Munich, but similar fairs occur all over the country. It is the world’s largest party. Germans are very organized, efficient and orderly in their business. They do not like long discussions because they hate wasting time. The top executives of a company or organization conduct meetings with their counterparts, and hierarchy is given importance. Meetings are very formal, with an amazing amount of preparation and effort preceding each one. Germans tend to avoid on-the-spot and casual decisions. German professionals make the most of their time and tend to get straight to business. Because Germans are very straightforward, their communication may seem undiplomatic and brusque to a foreigner. Their business communication is a proof of this characteristic.